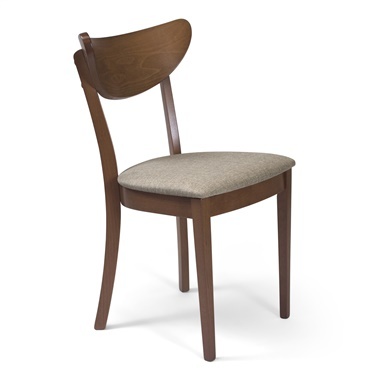 The Sigfred Side Chair boasts a curved seat and an eye catching accent stitching. The padded upholstered seat makes this chair comfortable while the black powder coated base is sturdy and classic. 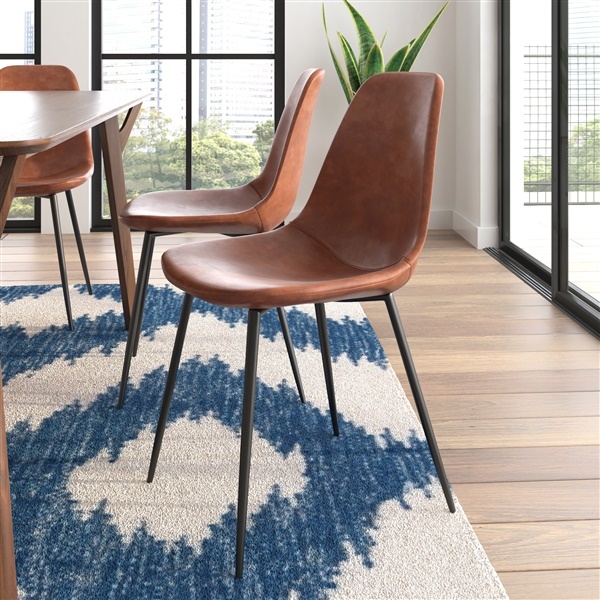 Available in your choice of color, the Sigfred Chair is all about the details. COMFY SEAT, GREAT COLOR & FEELS ULTRA STABLE! Upholstery is "creamy" soft and smooth, it is nice to the touch and comfortable when seated. The detail stitching is a subtle accent but gives it character. Probably one of my favorite home purchases of this year. I highly recommend. I ordered in gray upholstery and based on the photos I thought the legs were going to be a little lighter, more like a dark gray but not entirely black when they arrived. Later I revisited the page to see the features do specify they are black so I just recommend double checking features and photos when if you are buying online. Anyway, the gray upholstery turned out to be the correct color which was my primary reason for getting these. I am a little disappointed about the legs, but it wasn't a total loss. Work great in a traditional dining setting!! Upholstery has a vintage feel to it - love these chairs! Dining room complete!! Bought the table to match from here as well! THANK YOU!! I love them! Looking forward to having guests! I ordered in the vintage charcoal leatherette and they look stunning! They are even more comfortable than I thought they would be and the quality of the faux leather is like the real thing. I am so excited they finally arrived and I'm looking forward to having company come over now! remarkably comfortable design, padding on a chair like this feels too good to be true, i will be definitely shopping here again in the future! Looks and feels like real leather. Very sturdy and high-quality. Price is excellent and customer service was helpful! I've NEVER seen chairs quite like these and they exceeded my expectations. Great looking upholstery. Loving the "vintage" look of the leatherette. Comfortable and the price cannot be beat. Was looking for some chairs for the table for weekly card night, came across these beauties and couldn't say no. The entirety of the rooms ambiance has shifted from a basement to a Casino Aesthetic! Happy to have made this purchase! I've been an Inmod customer for a year now and I've never been disappointed. I was in the market for new chairs and came across these. They shipped quick and I couldn't wait to get them. I put them around my kitchen table and it completely transformed the space (not to mention the price can't be beat). Another great purchase. The Sigfred Side Chair is rated for use up to 250 lbs. Where can I find pictures of grey fabric and other colors? You can view the different color options by clicking through the thumbnail images on the product page. If you would like to see swatches in person, you may email your request to [email protected] Please be sure to include the name of the item, the colors you would like to see, and your mailing address.